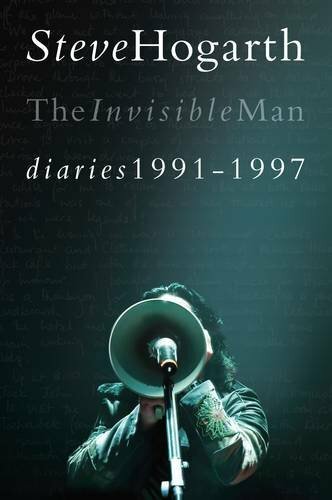 Share the post "Book review: STEVE HOGARTH – The Invisible Man – Diaries 1991-1997"
Steve Hogarth chats about the Diaries. (13:36) The full version of this interview featured in ‘Assume The Position’, Sunday 13 July at 22:00 GMT on Get Ready to ROCK! Radio. More about Get Ready to ROCK! Radio Listen in using the buttons at the top of the page. When I first spoke to Steve Hogarth seven years ago, for a podcast that pre-dated the launch of our radio station, it was evident that he was an easy going bloke. And that view remained unchanged when I caught up with him recently to chat about his new book and band. As he told me, he tends to bare his soul a bit, publicly. This can be a blessing and a curse, of course, and has probably resulted in one or two fan encounters where they out-stay their welcome believing that Steve is their new best friend. But you can’t help thinking that Steve would be a great guy to go to the pub with and, now, you would have 300-plus pages of “diary” to discuss. Fans may be disappointed that Steve’s notebooks only date from 1991; that crucial formative period with Marillion in the late-eighties and, moreover, shaking off Fish’s rather large shadow, is not dealt with. The book also overlooks Steve’s earlier musical history, from a time in 1978 when he recorded a single in the band Harlow and then went on to make a couple of great albums with the Europeans and – just before he got the call from the Marillion camp – one with How We Live. It’s a gentle and honest trawl through this singer’s back pages and this first volume (1998-2014 is on its way) reflects a time when Marillion were chaperoned by EMI who had high hopes for the revitalised unit with Hogarth’s fresh input. 1991-1992 was particularly busy as the band promoted ‘Holidays In Eden’ in Europe and both North and South America. Readers will not find too much detail on the writing/recording process (for example ‘Brave’ is despatched in one diary entry covering the period February to April 1993) but that history is covered to some extent on the band’s website. And that entry reiterates that this is not a daily account, there were evidently times when Steve didn’t take notes. Fans will, however, lap up the whirlwind narrative of their hero crossing several countries, sometimes in one day, in pursuit of his art form and their band. The diary details the relentless touring and promotion but also those quieter moments when Steve can do some catch up at home, cuddle the kids, settle down with Inspector Morse and brush the leaves up in his garden. This is only going to endear Steve more to his fans, more than half of whom must surely be female? Readers shouldn’t expect any great controversy or muck-raking – and, as Steve says, the fans already know what makes him tick and this has been revealed particularly through his lyrics over the years. But it does provide a supporting commentary on the life and times of a musician on the road (in slightly more economically buoyant times it has to be said). And I am sure it will have fans reaching for their well thumbed copies of earlier Hogarth-period albums. Given the absence of “kiss and tell”, readers can deduce from Hogarth’s prose and read between the lines in places. I thought his early reference to Steve Rothery who told him “that if I ever leave the band he’ll kill me” was quite telling. With regard to his new singer, I bet Steve R had thought all his Christmasses had come at once. As an insight to his fellow journeymen, the book is polite and deferential. We know, as if we hadn’t already suspected, that Mark “Jack” Kelly tweaks his keyboard settings very close to show time and he seems closest to ‘H’ as they grab a coffee or go sight-seeing. But Ian Mosley’s protective attitude towards 1990′s band manager John Arnison makes me think there were understandable early tensions as the members of Marillion all found their own level with the arrival of their new vocalist. This is patently evident when Steve was politely asked to “go home” during the ‘Holidays In Eden’ sessions. This entry was posted in All Posts, BOOK REVIEWS, INTERVIEWS, Interviews/Rock Stars and tagged book, Diaries 1991-1997, How We Live, Marillion, MIWK Publishing, review, rock, Steve Hogarth, The Europeans, The Invisible Man. Bookmark the permalink.